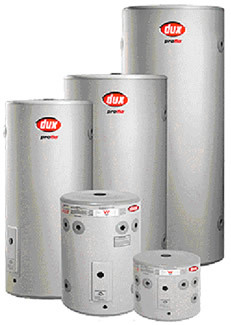 Dux electric hot water heaters, hot water systems and hot water units are made in Australia. electric hot water system, electric hot water heater or electric hot water service. the Brisbane or Gold Coast areas. Flo-Rite Plumbing can also supply and install the latest Solar Hot Water Systems, as well as the 5 star energy efficient range of Gas Hot Water Systems and the latest models in the very economical range of Heat Pump Hot Water Systems. Our reputation has been built on providing prompt, quality service at competive prices. If you are looking for water heating repairs or replacement, we offer the best advice you need to make an informed decision. Our service vehicles are fully equipped to carry out hot water repairs to Dux Hot Water Systems, Hot Water Heaters, Hot Water Tanks and Hot Water Units including all other major brands. Contact us for free advice and quotations for your new hot water system or hot water heaters and receive prompt attention from our experienced and qualified staff.